was the image created with blender? It's for real, it is a shot of the island where I was brought into the light. Taken from a boat from about ten miles before approaching the island. I only enhanced it with showfoto. 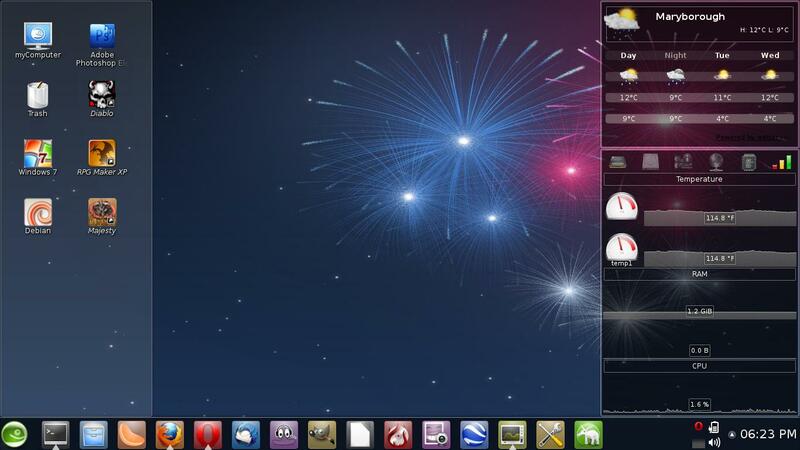 Just simple gnome shell for me. I am using OpenSUSE 12.1 for now full time. I am not sure if I will switch from gnome to KDE though. Beautiful wallpaper. Is it from some anime ? Hi glistwan, thanks for the reply. Here is my desktop picture today. Like you pic jdmcdaniel3. Hopefully not inappropriate, but you can make out some slight details on that lovely lass on the middle left (Now i hope they're not your daughters lol). Here's mine at the moment. It's not Fedora, i swear. I've found i've admired Fedoras artwork quite often. Like you pic jdmcdaniel3. Hopefully not inappropriate, but you can  make out some slight details on that lovely lass on the middle left (Now  i hope they're not your daughters lol). Here's mine at the moment. It's not Fedora, i swear. I've found i've admired Fedoras artwork quite  often. Well I would just say the outfits they are wearing are some what skimpy and a nice fireworks display knightron. Its just another month here before the Forth of July celebrations with lots of fireworks.